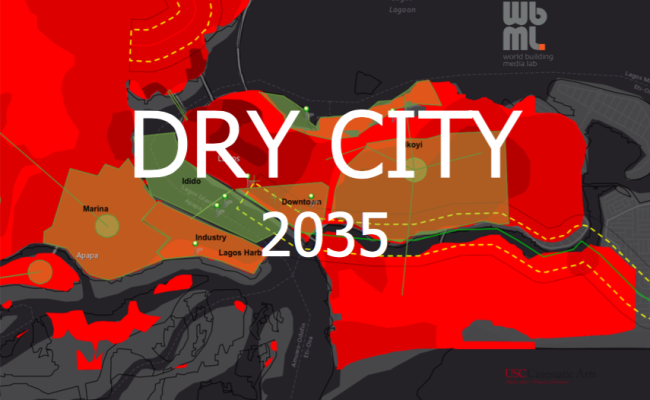 Dry City imagines a future in which water has been privatized, commodified, and transformed into currency in the wake of global economic disaster. 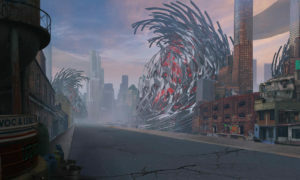 Inspired in part by the award-winning work of Kunlé Adeyemi and his architecture, design and urbanism company NLÉ, the 2015-2016 world building class of student architects, interactive media designers, musicians, engineers, urban planners, animators, filmmakers and artists chose to focus on the Nigerian city of Lagos and its neighborhood of Makoko in the mid-2030s due to Lagos’ rapid urbanization, Nollywood influence, booming economy, and growing population. Most intriguingly, Lagos now is water-poor despite being a port city on the Gulf of Guinea, an irony doubly true for the floating village of Makoko on Lagos Lagoon. The first semester course focused on Lagos in 2035, and the second semester’s course honed in on Makoko in 2036 to more completely evolve the world. 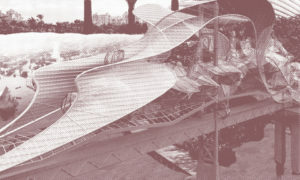 Following the WbML’s world-centric narrative design methodology, the students collaboratively envisioned multiple interlocking and holistic aspects of this future world, deeply grounded in research into real present-day Lagos conducted through texts, videos, articles, and interviews with guest speakers from Nigeria, Lagos and Makoko and experts in various fields. A deep research dive exploring the possible ecological state of 2035, including a potential rise in sea level, revealed that Makoko, as a traditional fishing village raised on stilts over a floating body of water, might be better equipped than inhabitants of the mainland to adapt to this state of affairs. The current economic and political tensions between Makoko and Lagos hinted at how this impoverished community might reinvent itself in the coming years, as it has been forced to do repeatedly since its creation in the 1700s. Other aspects of this insular community promising for future speculation included a process they created for terraforming the lagoon, their access to cellphones, their aptitude for repurposing technology, and the social networks they have formed for recycling raw material. These led the second-semester team to imagine that by 2036 Makoko has been cut off from the power grid and Internet by the government of Lagos, but that it has not been destroyed due to its self-sufficient nature and growing awareness and support from the world community. Keeping a human lens firmly at the center of the world build, each student developed a character and then envisioned a day in their character’s life, imagining everything from the contents of a character’s purse to their daily routine from hour to hour. This bottom-up speculation enriched the students’ understanding of Makoko, Lagos, and the larger world in 2036. While our 2036 Makoko shares conditions, elements and topography with the real Makoko in 2016, our Makoko’s fictional status allows us to imagine myriad possibilities for the culture, future, technology and landscape while exploring themes, issues and possible futures of body image, food, education, media, VR/AR devices, medicine, desalination, synthetic biology, smart materials, vertical farming, war, water parks, banking, informal urbanism and water economics. These explorations use a wide range of media and platforms, including app prototypes, physical artifacts, photography and web-based graphic design, fictional blogs, a film festival and experimental social media storytelling. 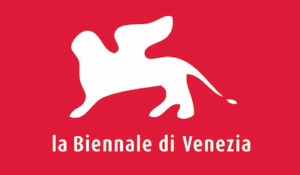 The students’ projects were showcased in the USC IMAX theater at the end of the fall 2015 and spring 2016 semesters, and in Kunlé Adeyemi’s Silver Lion-winning Makoko Floating School replica at the 2016 Venice Biennale.